Call us today for keyless entry systems! For security gate installations and keyless entry systems for your home or business in Greensboro, NC, count on the staff at Piedmont Access Control! Want to raise the level of security for your company in Greensboro, NC? Piedmont Access Control a licensed security contractor and IDEA-certified electric gate installer. Their team of experts can provide you with a customized design, fast and affordable installation and reliable repair services when needed. Welcome to Piedmont Access Control. They are a division of Piedmont Fence, Inc., that provides commercial, residential and industrial properties throughout Greensboro, NC and the surrounding areas comprehensive entry control and security services. They offer a huge selection of various fence gates and controlled entry systems that are equipped with high-tech security gates, video surveillance, remote electric gate access and card reading systems. Whether you need a security gate installed for your home or your business, you can be reassured that you are receiving the best with to Piedmont Access Control. Can you think of any better way to feel safe and protected than with an excellent new electric gate and keyless entry system? Since 1980, residential, commercial and industrial property owners from Greensboro, NC and the nearby areas have found trust, reliability, efficiency and convenience by choosing Piedmont Fence as their go-to for all of their security gate and other electric gate needs. From repairs, maintenance agreements, safety, variety and service, you can count on Piedmont Access Control! North Carolina’s top choice for controlled entry systems, security gates, and other security solutions. For more information on Piedmont Access Control, visit their website. There you can find out more information on all of their electric gate services, products and packages, as well as telephone, card, video and keyless entry systems for security gates. 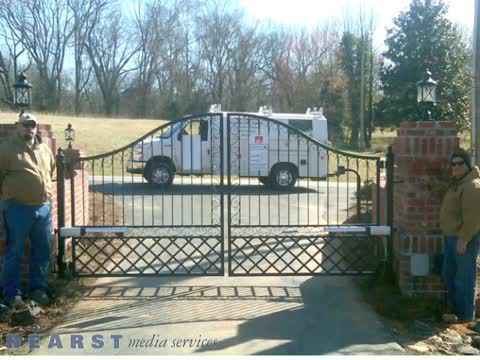 Their electric gate experts can provide you with the repair services and maintenance packages you need to reassure the full and proper functioning of your system and security gate. You can receive one to four maintenance visits per year depending upon your electric gate usage and needs. Every keyless entry system and security gate is installed to meet all UL-325 gate safety standards for your ultimate protection and satisfaction. Piedmont Access Control is a leading electric gate and security gate service provider for the Piedmont Triad. They offer their residential, commercial and industrial customers throughout the Winston-Salem, High Point and Greensboro, NC areas with the best in installation, custom design, repair and maintenance services. If you are looking for a security gate, keyless entry system, or an electric gate repair, you’ll know who you can count on for the most effective and reliable service. Contact a Piedmont Access Control technician for a free site evaluation and free estimate today! Estate Gates & Gate Operators, Telephone Entry Systems, Digital Key-less Entry, 'Card readers, Passive & Active reader systems, Remote gate Access, Video Surveillance, Electronic Door Access, Intercom Systems, Data Management and Service, Upgrades & Repairs! Ameristar, Lift master, Linear, and Doorking and last sentence should read: Traditional to Custom systems available.